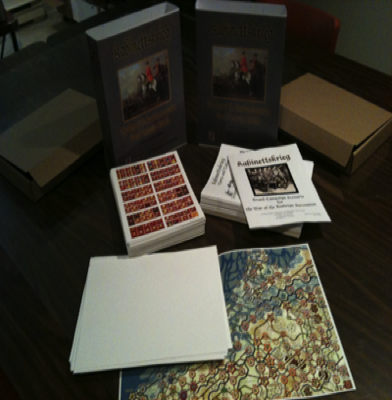 Kabinettskrieg (KK) - Cabinet War - is a grand campaign module for the four War of the Austrian Succession games: Cockpit of Europe, Charlie's Year, Sport of Kings, and Queens' Gambit. As such it provides rules for linking all three of the Continental games, with the option of including Charlie's Year. By order of his Most Royal, Puissant, and August Presence, the KING, you are hereby appointed Generalissimo of all royal troops currenty serving in the field. Your instructions are to carry the war to the enemy in the manner you best see fit, but not so as to endanger either the realm or the royal purse. If you fail, there will be... displeasure. Your duties commence at once. Do not return without victory. 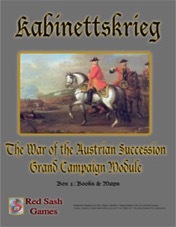 The War of the Austrian Succession is one of those forgotten "Cabinet Wars" of the 18th Century. It is the war of which Voltaire quipped that the sole result was the transfer of a single province. But that povince was Silesia, and its transfer from Habsburg to Hohenzollen rule signalled the rise to power of Prussia and the eventual "prussianisation" of Germany. Elsewhere, the war began Britain's psychological dominance of the waves and the bowing out of Spain from mainstream European affairs. Most of all, it ensured the survival of the Austro-Habsburg Empire for another two centuries. Even taken in isolation , the war has much to recommend it as a study. It killed an estimated half million people. Desperate actions were fought: Mollwitz, Campo Santo, Dettingen, Bassignana, Fontenoy, Hohenfriedburg, Rocoux, Piacenza. Befitting an age when men engaged in war to obtain personal glory, great feats of arms were performed: the Retreat from Prague over the trackless Erzgebirge in the dead of winter; the stand of the British Square at Fontenoy against the French Maison du Roi; the Piedmontese counterattack at Campo-Santo; the Fench using the bodies of their own dead to buld a ramp against the mountain-top fort of Assietta; the Prussian infantry advancing silently in parade-ground order at Mollwitz. The war had its share of great captains, too: the French marshals Saxe, Maillebois, and Belle-Isle; the Austrian marshals Daun, Traun, and Browne; Marshal Gages for the Spanish; and the great Frederick himself for Prussia. Strategy may have been driven by the whims of kings and queens, but the operational art, as practised by those who had to fulfil the objectives of an irrational strategy with insufficient means, was in full bloom. Frederick's oblique attack was born in this war - in a battle between the Austrians and the Spanish. The French marshal Maillebois conducted an Italian campaign so brilliant Napoleon would later take it for a model. An Austrian marshal - von Traun - inflicted 30,000 casulaties on the Prussian Army without fighting a battle. Advances were made in the science of war, too - not least, Prussia's iron ram-rods (a pre-war innovation also used by Spain). Experiments were made with the use of light infantry, the three- and two-rank line of battle, and with all-arms formations - radical ideas mostly shelved and forgotten, of course, on the outbreak of peace. Up to 8 people may play (more if you wish to try team play). Map scale remains the same but the pieces are rendered at Battalion scale - that is, battalions and regiments. 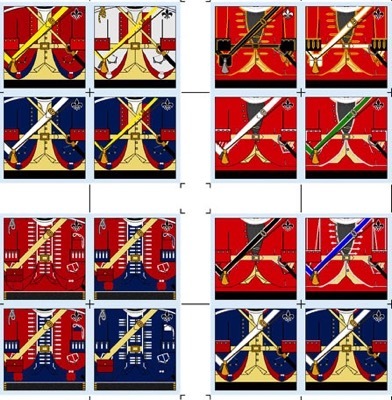 Every unit that fought in the war is represented, most of them with accurate uniforms. When originally issued this module also updated the map art but the sheets are now included with the individual games. However, KK includes the SoK Bonus Map set. 1) Six map sections representing the three Continental theatres of the war. Scale is 8.5 miles per hex (roughly 4 leagues per hex). 2) Over 3000 die cut counters representing all the combattants at battalion and regimental level. IMPORTANT. Ownership of CoE, SoK, and QG is required to use this module.